Thank you for using AdDuplex and recommending it to your friends and followers! Your help spreading the word is highly appreciated. But simple “thanks” is not enough to express our gratitude. So we decided to launch a referral program where you can earn more impressions for your apps by referring other developers to AdDuplex. Share this link on Twitter, Facebook, etc. and when a user joins AdDuplex via that link you will get 5% of the impressions served by apps developed by this user for the next 6 months. And they will get 5% more impressions too! So that’s an incentive for your friends to register via your link rather than just registering as normal. Here’s an example. 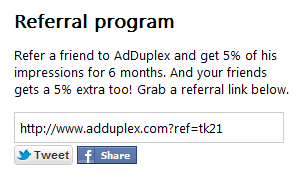 Suppose you’ve shared the referral link on Twitter and 5 of your followers joined AdDuplex via this link. They’ve published 2 apps each and each of these apps serves 10,000 impressions a day on average. So over the course of 6 months you will get 90,000 impressions as a bonus to promote your own apps. And some apps serve more than 200,000 impressions a day. So if you refer one of those you’ll actually get close to 2,000,000 impressions for free! Not bad, right?